Black Friday Deals Have Arrived at Secrets Resorts & Spas! The biggest shopping day of the year is upon us and you know that Secrets Resorts & Spas is getting in on the fun! For 72 hours only we’re serving up our best vacation deals of the year for our fans! These special rates will have you jetting off to Secrets Playa Mujeres Golf & Spa Resort and the new Secrets Playa Bonita Panama Resort & Spa for an incredible price! Our 72-Hour Black Friday Sale has been extended throughout the month of November! 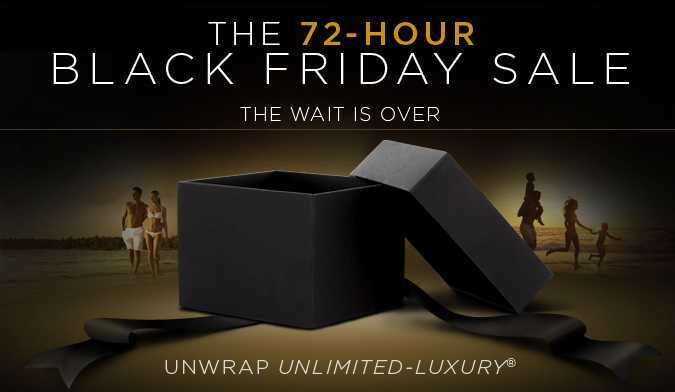 Keeping unwraping Unlimited-Luxury® ! We’re offering exclusive savings at Secrets Royal Beach Punta Cana when you book between now and Friday, November 30th! Experience Secrets Royal Beach starting at just $172 per person per night when you travel from January 2 to April 30, 2013! Your search for the perfect gift is over. But hurry, this offer only runs for the weekend! Book today!